To analyze your data, Panoply integrates with Business Intelligence (BI) tools such as Metabase, Tableau, Data Bricks, Looker, Chartio, Power BI, Re:dash, Zeppelin, iPython Notebook, Shiny Apps by RStudio, and Sisense. Any BI data visualization tool that supports ODBC, JDBC, Postgres, or AWS Redshift can connect to Panoply. The credentials needed to connect to Panoply are available by clicking Connect from the side nav. This will display a window similar to the following image. Chartio has a native Panoply connection, which makes it easy to connect Chartio with your data in Panoply. In Chartio, under Data Sources, click Panoply. The host name and database port are automatically populated. Enter your database username, password, and database name. You can find your username and database name in Panoply under the Connect menu item. Enter your schema name. Depending on how data is imported in Panoply from your data sources, the appropriate schema could be public or a specific schema name. You can identify the available schemas by clicking Analyze in the navigation menu, which opens the Panoply workbench. Your tables and views are listed in the right-hand column and are organized by schema. Enter a data source alias, which is a nickname for this connection within Chartio. (Optional) To customize which tables are selected, expand the list of tables and clear the Include checkbox for any tables you want to leave out. You have successfully connected Chartio to your Panoply data warehouse. In Looker, browse to Admin, then under the Database heading click Connections, and then click New Connection. Enter a name for your database. This is not your username or your database name in Panoply. In the Dialect field, select Amazon Redshift. Enter the host and port details, which you can find in Panoply under the Connect menu item. Enter your Panoply database username, password, and database name. You can find your username and database name in Panoply under the Connect menu item. (Optional) Configure the additional Looker Connection Settings. You have successfully connected Looker to your Panoply data warehouse. Panoply integrates with the Desktop version of Microsoft’s Power BI. We do not currently support Power BI Cloud. Open Power BI Desktop log in using your Office 365 credentials. If you don’t have an Office 365 account, fill out the form to create an account and log in. Select Database, then Amazon Redshift, and then click Connect. Panoply’s smart data warehouse operates on top of Redshift and will use this driver to connect your data. Enter the server and database connection details, which are found on the Connect page in Panoply. Import - Pull all of the data from your Panoply DB local to be queried in Power BI. 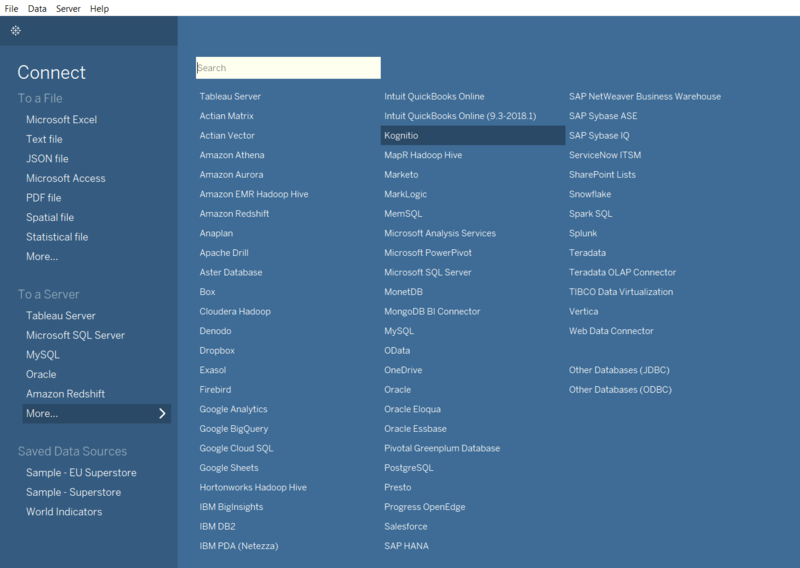 DirectQuery - Have Power BI query your Panoply data warehouse. Enter your Panoply data warehouse credentials, which are the same details you would use to log in at panoply.io. Your username must be lowercase. A list of your tables and views populates in the navigator. Select the tables and views you’d like to visualize and click Load. You have successfully connected Power BI Desktop to your Panoply data warehouse. Log into Google Data Studio. Create a new data source by clicking the blue + button in the lower right hand corner. Type PostgreSQL into the search bar, and then select the PostgreSQL connector. Enter the server and database connection details, which are found on the Connect page in Panoply. Exception: set the Port to 5432. Select your tables, and then click Connect in the upper right hand corner. You have successfully connected Google Data Studio to your Panoply data warehouse. 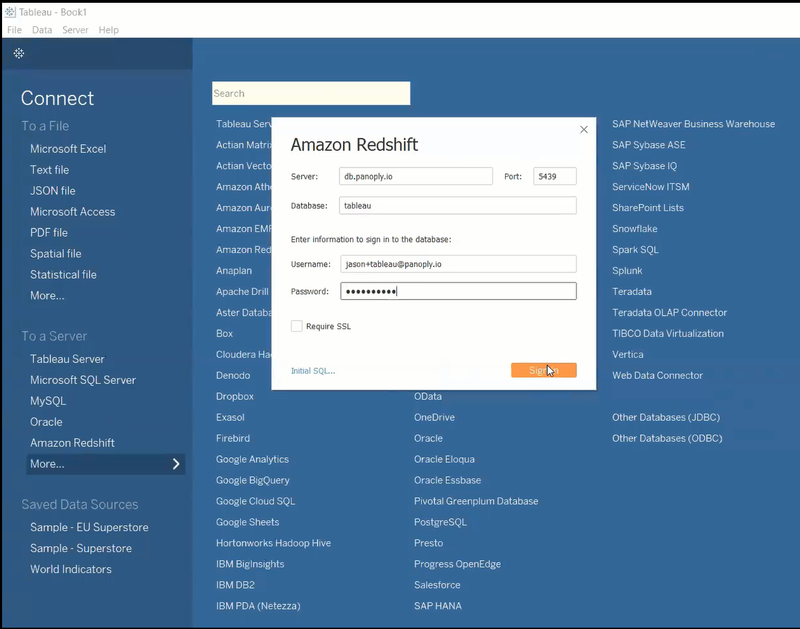 In Tableau, under Connect > To a Server, click Amazon Redshift. Enter the server, port, and database connection details, which are found on the Connect page in Panoply. Enter your database username and password, and then click Sign In. You have successfully connected Tableau to your Panoply data warehouse.